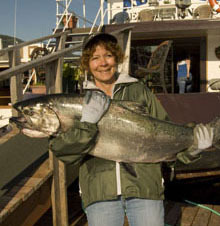 Alaska sportfishing lodge and charters. Alaskan Experiences LLC is owned and oporated by Neil Voelckers and his family. Neil is a long-time fisherman, and loves the interaction between Angler, Elements, and Catch. He likes people, and employes folks like him to help share the unique experience of fishing in Southeast with guests from all over the world. Among these people are his two sons, who are the licensed captains of our two sport cruisers. They're experienced and a real hoot to spend time with. We also maintain a full staff who clean house, cook, and deckhand. It's a family affair. What does a trip look like?